Café de L’Homme is one of those cafes in Paris that you cannot miss. I have a rubric on which I rate establishments for dining out. I call it the “Dining Out Trinity” and it is based on a line from my idol: The great Carrie Bradshaw. She said that in New York, you either looking for a good relationship, a great job, or an apartment, but it is very rare to have all three. That is how I feel about dining out. 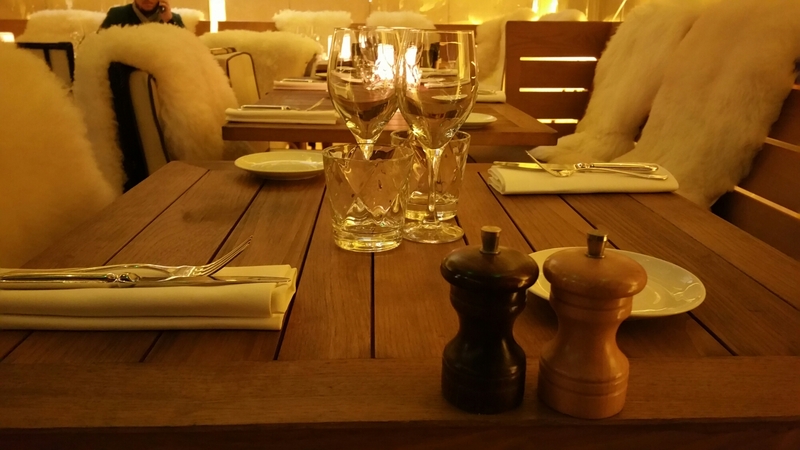 When dining out you either have great atmosphere, impeccable service, or great food. Café de l’Homme is one of those rare places that scores a 10 in all three areas. Café de l’Homme during the winter is magic. Well, in summertime it is magic too, but the winter brings a special type of magic from their event “Come Skiing in Paris”. It is mountain ski lodge decorum with plush sheep skin hides on the seats, glowing candles on polished glassware and perfectly placed cutlery, with a blanket to wrap up in. In fact you are in the middle of a big cosmopolitan city, but you feel like you’re in the Alps. I have been skiing. I used to go for school trips in New Jersey. Yes, we ski in New Jersey! I always looked forward to going, but I hated skiing. It was very odd. I realize now that I liked the ambiance of the lodge but not the sport of skiing. I was the one spending more time in the cozy lodge than on the powdered slopes. I like the simplicity of the ski lodge. I liked that it had a back-to-basics feeling that comes from the raw materials (wood and fur). I liked that it made you feel warm after being outside in the cold, but not only the physical warmth from the heat, but also the warmth of the situation. I loved how happy everybody felt and how stress free the air was. It was like being able to hit the “pause” button on life. That is exactly how I felt at Café de l’Homme. The expansive dinning room is decorated just like a mountain retreat and turns this usually trendy spot into an instant ski resort. 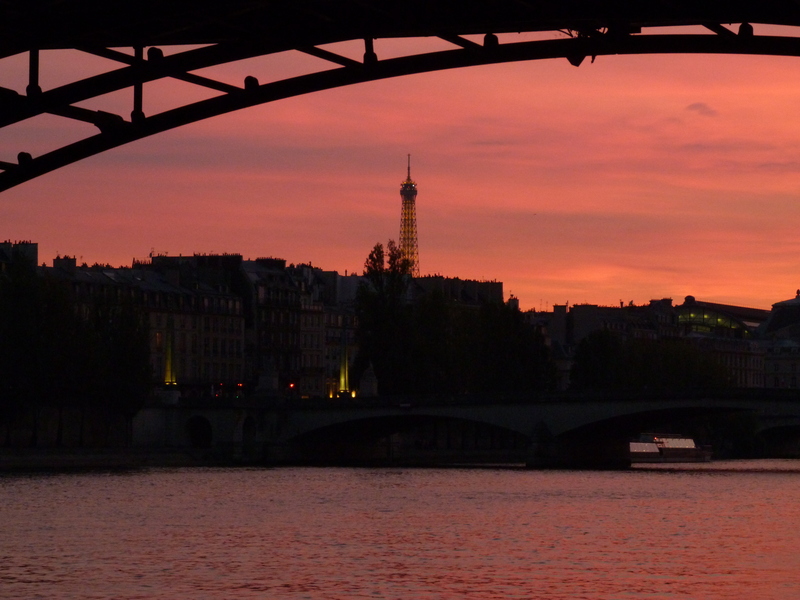 But that is not the only element creating a palpable ambiance here….lest we forget the Eiffel Tower. For lovers of Paris and of France, she is the masterpiece that symbolizes achievement, beauty, and well, a burst of sparkle on the hour every hour after dark until midnight can surely boost any ambiance! When you sit at Café de l’Homme it’s right in your face, you can’t miss it. The tower hardly seems real half the time because you are so close. For many of us, The Eiffel Tower is a symbol of that which we have dreamed of our whole lives. She evokes an incredible amount of emotion, because when you bask in her glow you are reminded that a life goal has been met. Like Melissa, I’ll never get tired of watching that beautiful tower shine. The tower is like a motherly figure to me. I have distinct memories of standing on various spots in this great city just staring at her. Now, when I see her sparkle, it reminds me that dreams do come true and fills me with hope. While you are marveling at the Eiffel Tower, you might get a visit form a delightful woman named Coco. That would be Coco Couperie Eiffel. OUI! You read correctly. She is the great great grandaughter of Gustave Eiffel, the genius who built the Eiffel Tower and gave France it’s most famous attraction. At first when someone pointed her out to me, I was intimidated, thinking “there is somebody from a family that is so precious to Parisian history”. Once we started talking, I let my guard down and felt instantly at ease. Coco Coupérie Eiffel is a lovely and vibrant person. She has a positive vibrant energy that makes her seem like a friend to the happy guests scattered around the dining room. 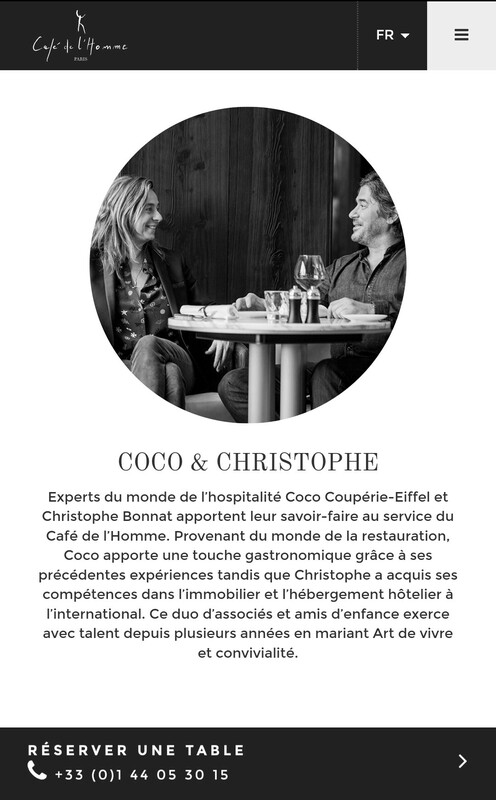 Coco and her longtime friend and business partner, Christophe Bonnat spent some time at our table too, sharing their Parisian experiences at the Cafe de l’homme and all around the City of Light. They are both jovial with their guests and their staff and you can tell that they have a fantastic relationship with all who work there. The Café de l’Homme has a fun and relaxing environment and the owners play a major role in that. And of course, one of my favorite parts of the night was the meal. Like most restaurants, we had the option of a three course meal. Ours included beef, potatoes, fish, mixed greens and other my God, the desert. 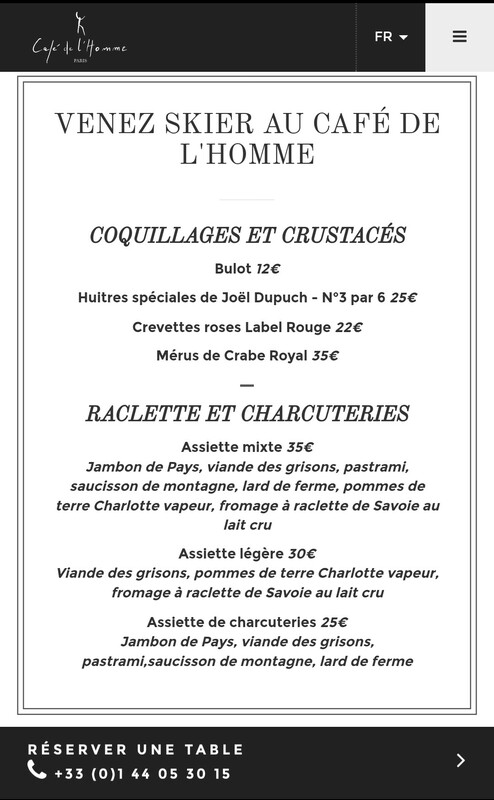 Just by going on the website, you will see that Café de l’Homme is very proud of its chefs who have created the menu. They come from all over the world and they have years of experience in food and wine. The presentation is beautiful. Every plate is like a work of art. I tried to get what everybody else was not ordering so we could get a full view of the menu. 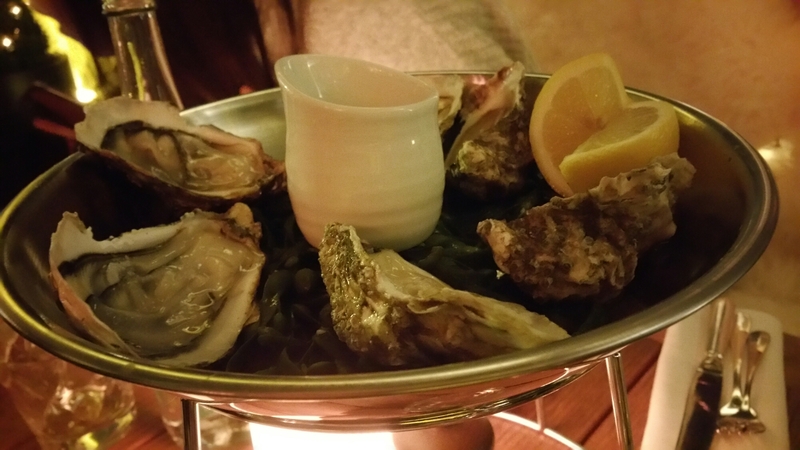 We started out by ordering oysters and shrimp. 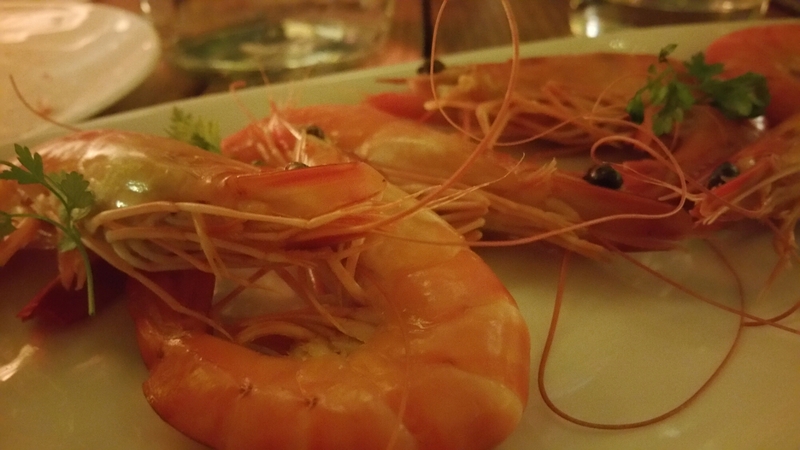 The shrimp come whole and are all laid neatly on a plate. 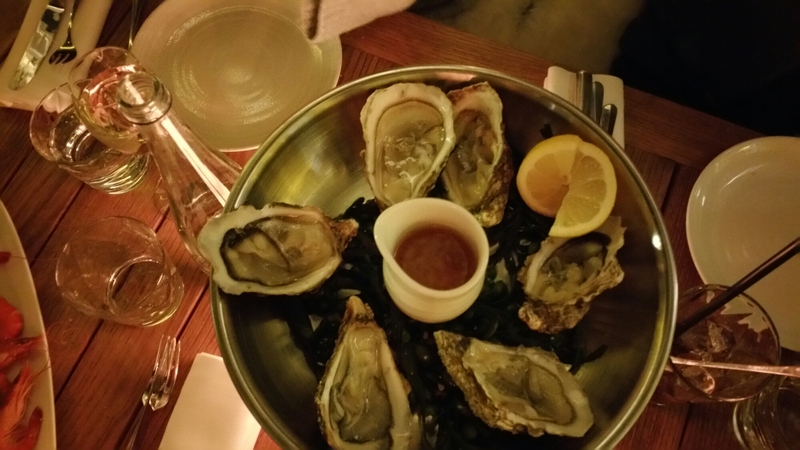 It was at this dinner how I learned the French art of getting the shells of shrimps with only a fork and a knife. For the second course, you have three simple choices. You have a “Mixed Plate” a “Light Plate”, and a “Charcuterie Plate”. I got the light plate which was very satisfying with slices of “viande de grison” which is a Swiss specialty of very low fat thinly sliced beef sausage. On the side, I got potatoes with melted cheese on them it was to die for. After talking to Coco and Christophe and going out to the benches to take selfies in front of the Eiffel Tower, I was ready to move on to desert. The desert menu is full of ice cream and tarts. I got myself a lemon meringue tart which is my absolute favorite and I will tell you right now that I was in food heaven. The quality and the presentation of the food made the experience more fantastic than I could have ever imagined. It was as if the chef made it specially for you and that it just wasn’t something on the menu. That kind of attention to detail that can be found throughout the Café de l’Homme and is the result of true passion. 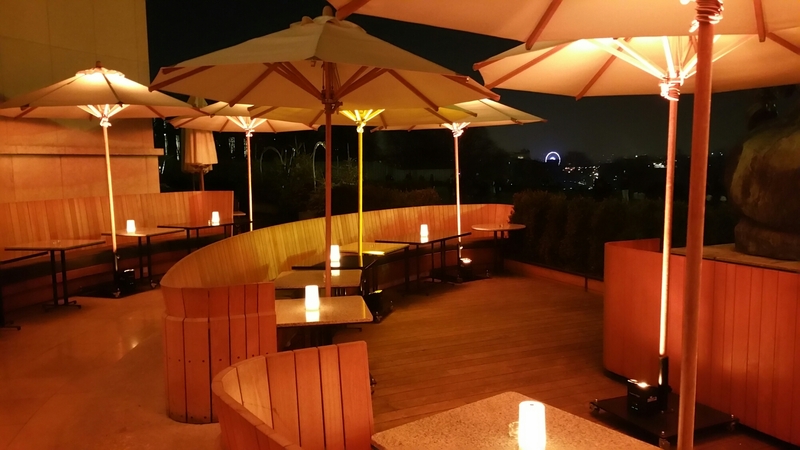 If you are in Paris, especially if it is your first time, do not miss Café de l’homme ski resort ambiance, it lasts through March 2017. I promise that you will leave with a memory to last lifetime! I would hope so! Enjoy and happy birthday!